Bryn Mor Beach Hotel Bed & BreakfastLocated on the magnificent Snowdonia Coast (Llyn Peninsua), the Bryn Mor is situated on the idyllic coastline and just a stone's throw away from the beach. Our family-run Bed and Breakfast offers guests a peaceful break away from the hustle and bustle, with our nine en-suite double and twin rooms offering a comfortable rest for the night. We also welcome dogs here so guests can rest easy in not worrying about having to leave their beloved pets behind (*please note, it is subject to our policies). 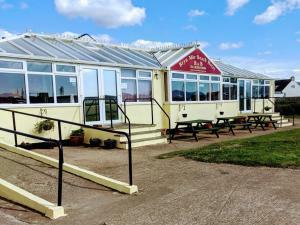 We have a licensed bar, pool table, conservatory and seating in the reception area for guests to relax and unwind, free Wi-fi throughout and free on-site parking with CCTV operating. Several popular tourist attractions such as Snowdonia, Portmeirion and Caernarfon Castle are within a 15 - 30 minute drive. There are also some great restuarants to dine in nearby, with places like Bwyty Lleu (two doors away), and many choices in Caernarfon (just a short 10 - 15 minute drive) available for guests. We are just 1 mile from Caernarfon Airport, which also offers some spectacular pleasure flights for guests to soak in the beautiful Menai Straits and Snowdon mountain range from the air. With many more brochures available for guests to freely peruse at their leisure from our reception, there's a lot to see and do in Wales, whether you're after a romantic break, or a bit of adventure. Breakfast includes a personalised cooked breakfast freshly made to your liking in the morning (with vegetarian and vegan options available)*, as well as a selection of teas, coffee, juices, fruit, cold meat and cheese, croissants and spreads and bread to toast to your liking. We also offer the option of an Indian breakfast, at a surcharge (*please note this is subject to availability and will require at least 24 hours notice to prepare). Located on the magnificent Snowdonia Coast (Llyn Peninsua), the Bryn Mor is situated on the idyllic coastline and just a stone's throw away from the beach. Dog-friendly, charges are applicable. Ground floor accessible rooms. Children welcome from any age.